Painting projects don't always turn out as you hope, but repainting to solve previous paint problems isn't always the best solution. There are paint mishaps that can be cleaned up easily, even after they've dried. Others can be addressed with some creative camouflaging techniques. Often, small things can make an adequate paint job look bad. Paint dribbles, overspray on windows, sloppy trim painting and uneven borders at the ceiling line are small details that can detract from the overall finished look of a room but can be fixed easily. Even something large, like a bad paint choice, can be reworked without a complete overhaul. Inspect the entire room and make notes about what needs to be repaired. Group repairs and mark areas that need to be addressed so that you can find them later. 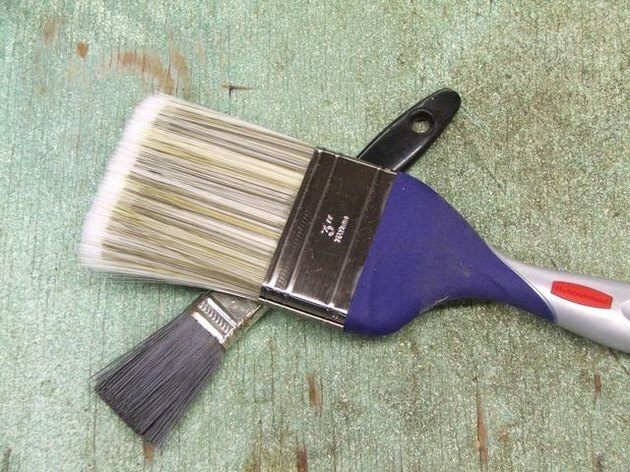 Using a small piece of painter's tape to mark a nasty spot will save you time when you go to sand or touch up later. Repair poor application problems by repainting trim and obvious dribbles and smudges. Large ridges may need to be lightly sanded with another coat of primer applied over the sanded spot. Instead of carrying around a big can of paint, pour some paint into a small plastic container and refill your brush from there. Touch up the areas where the wall meets the ceiling with a foam brush and a little extra paint. To cover dark colors, use a primer first. Remove paint spatter with paint remover and a very small applicator. Be creative; cotton swabs, small cloths and artist's brushes can all be used to help you get rid of spots or light over-spray. If you catch it soon enough, rubbing the area with a damp cotton cloth or sponge may be enough. Remove paint from windows with a window scraper and warm soapy water. Remove paint from carpets with either ammonia or dry cleaning fluid. Use water liberally to remove the cleaning agents and blot thoroughly. Adjust colors by adding paint washes. Going lighter or darker with a color wash can solve the problem of a poor color choice, adjusting the shade while still staying in the same color family. The process uses a mixture of paint and glaze that can create a number of quick and easy paint finishes. Painting with glaze is much more forgiving than using straight paint. The process is often more fun, too. Use glazing techniques to conceal unsightly flaws. Painting isn't going to hide uneven walls, raised spots, old drips or scratches, but ragging and some other glazing techniques may. These techniques can create dappled effects that trick the eye, concealing flaws and offering a number of other design solutions, like adding interest and depth to a room.